The most scenic drive in Canada has to be the Icefields Parkway, with the stunning snow-capped mountains and glaciers against an almost always blue sky. Save this to Pinterest for Later! I started this trip on a Rocky Mountaineer Train taking the Journey Through the Clouds itinerary from Vancouver to Jasper. 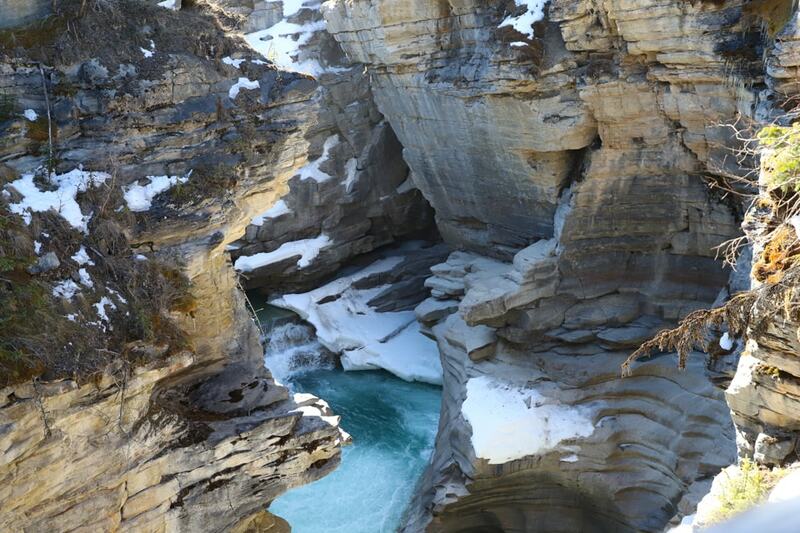 From Jasper, we took a day tour of the Icefields Parkway to Banff. Paralleling the Continental Divide, this is an amazing way to travel from Jasper to Banff! 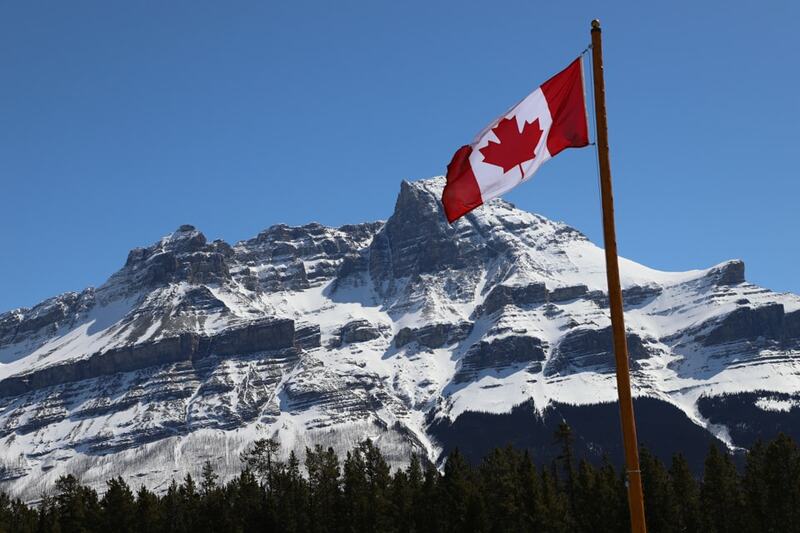 In fact, the Canadian Rocky Mountain Parks are a UNESCO Heritage Site. The honor of this designation was given in part because of the stunning landscape, but even more because of something you won’t see. The Burgess Shale originated some 540 million years ago, making it one of the most important fossils on the entire planet Earth, and providing evidence of the early evolution of most animal groups today. Note: To see the Burgess Shale outcrop, you’ll need to head to Yoho National Park, Kicking Horse Pass, or Kootenay National Park. The Icefields Parkway is a 232 km (144 miles) stretch of double-lane highway. And yes, you should put this on your bucket list. It is breathtaking. My suggestion is to take a guided tour, but you can certainly drive it yourself. Just be aware that there are no gas stations along the stretch of the Parkway, so get your gas either at Saskatchewan River Crossing in Banff National Park or in the town of Jasper. This is one of the most picturesque drives in the world. It runs between Banff National Park and Jasper National Park in Alberta, Canada. 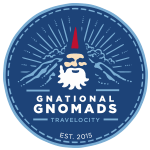 You will drive past more than 100 ancient glaciers, so grab your camera and your hiking boots! 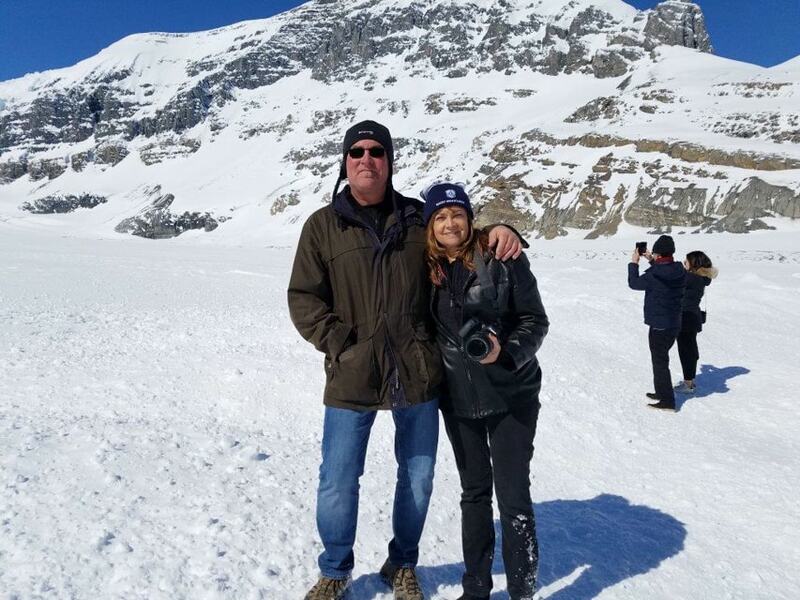 The glacial area that is easiest to get to is the Columbia Icefield. 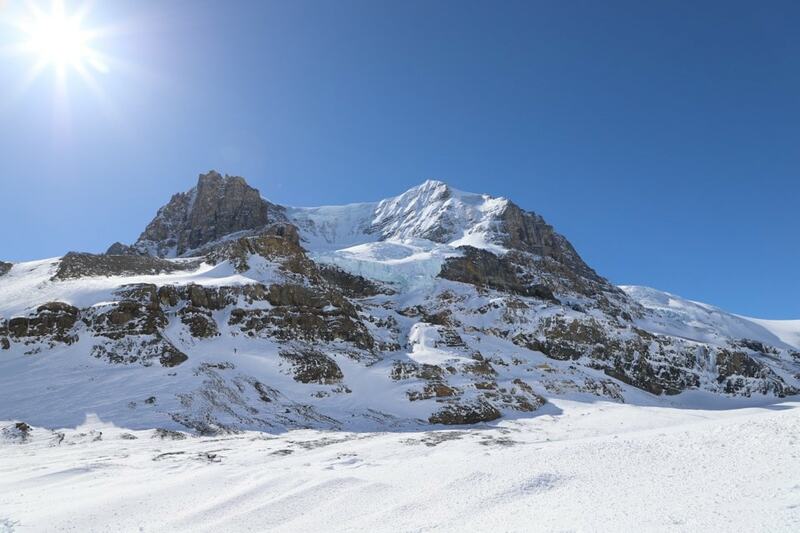 Most of Canada was covered with glaciers or sheets of ice 20,000 years ago, and the Columbia Icefield still exists because of the cold temperatures, heavy snowfall, and elevation. You are going to drive past some spectacular landscapes. The following are some of my favorite spots to stop and take pictures. Icefield Centre sits at the bottom of Mount Wilcox. Take some time to walk around and explore. The Glacier Gallery is pretty incredible and is a perfect starting point for those who want to understand glacier formation and movement. Spend some time checking out the hands-on displays surrounding the scaled-down model of the Athabasca Glacier. You’ll also find two restaurants in the Centre. We had lunch at Chalet and enjoyed a local beer. Yes, they had poutine! 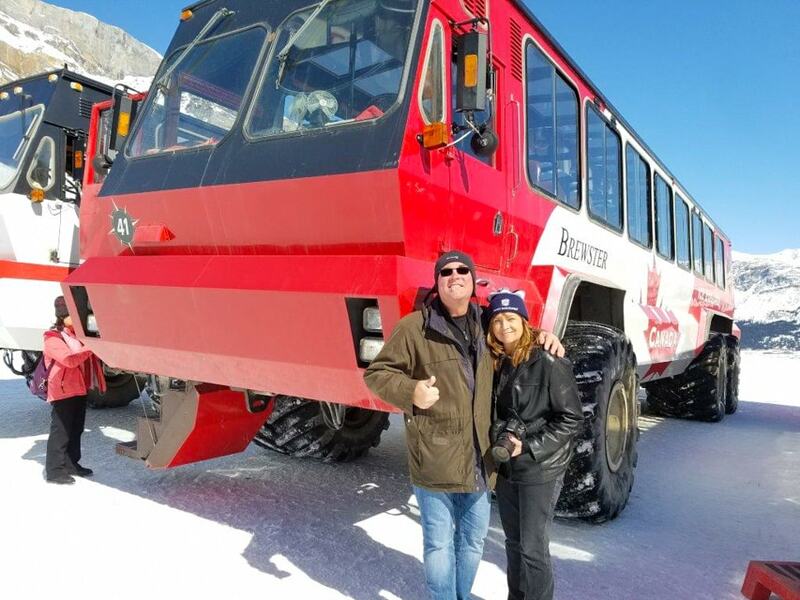 Icefield Centre is also where you’ll get your tickets to drive up on Athabasca Glacier with Brewster Ice Explorer. Yes, you do want to do this! Some day-tours include the Brewster Ice Explorer. The day-tour we took was about $200 per person, and again, was well worth it and included our Ice Explorer ticket. If you’re doing the Ice Explorer on your own, adults will pay around $100 and kids around $50. Tours are only available May through mid-October, from 9 am until 5 pm. The Athabasca Glacier is absolutely incredible. The size alone is mindblowing. 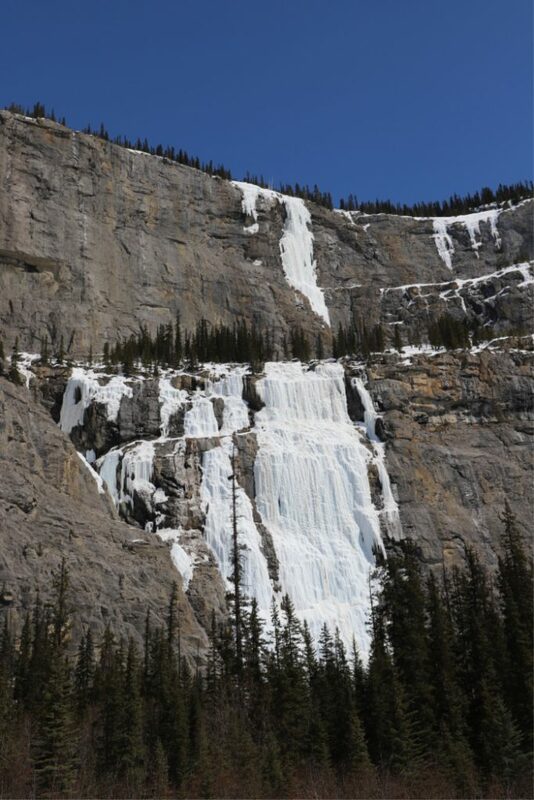 This is one of the six ‘toes’ of the Columbia Icefields. If you take a guided tour, your guide will surely point this out so you can understand it better. At 125 square miles in area and at its thickest point measuring almost 1,200 feet deep, you really have to see it to understand the magnitude of this glacier. As I had never seen a glacier before, I didn’t know what to look for. See the light blue color of the ice? 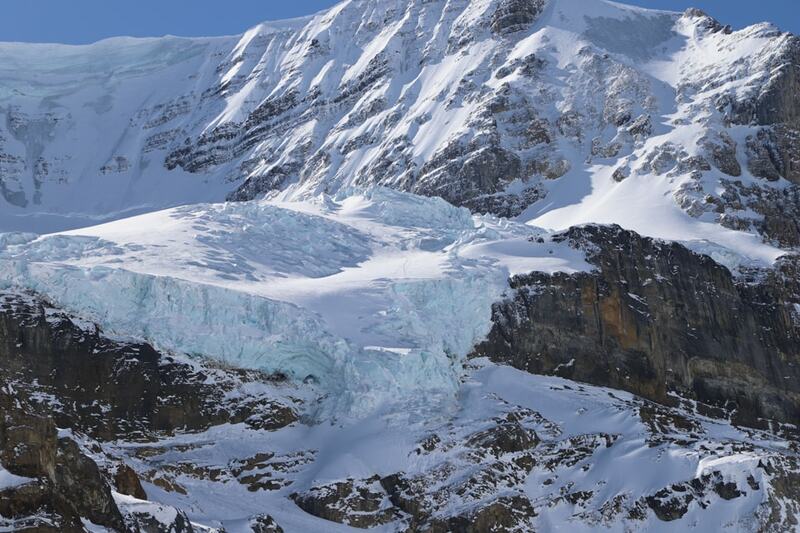 There are six glaciers in the Columbia Icefield, with Athabasca Glacier being the easiest to access. You can see Athabasca Glacier from Icefields Parkway. But seeing from the road is nothing compared to walking on the glacier. Brewster Ice Explorers drive right up on the glacier and gives you 60 minutes to walk around and get photos. It’s a rarity for me to have my photo taken as I’m always the one with the camera, but my husband made sure we got a few. I’m glad he thought to ask someone to take this. I always forget to get photos of us! 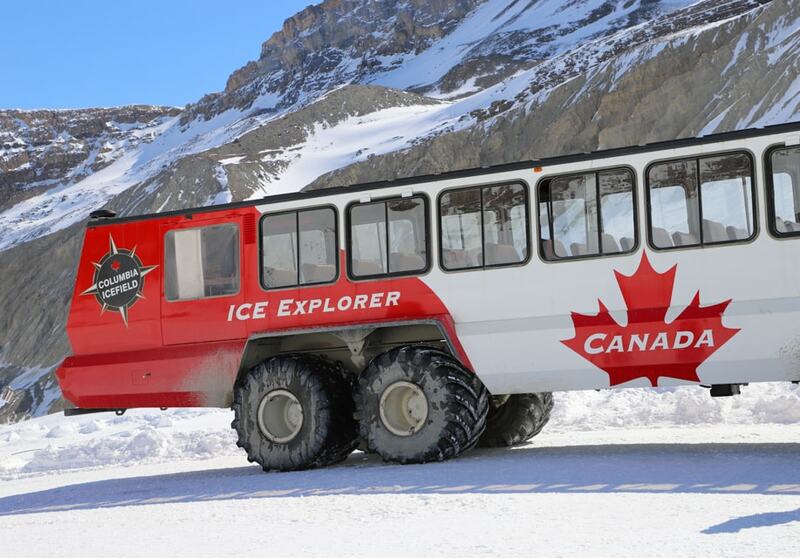 I read that military vehicles, like the Studebaker Weasel, were actually tested on the Saskatchewan Glacier, which inspired companies to lead tours on the Athabasca Glacier. 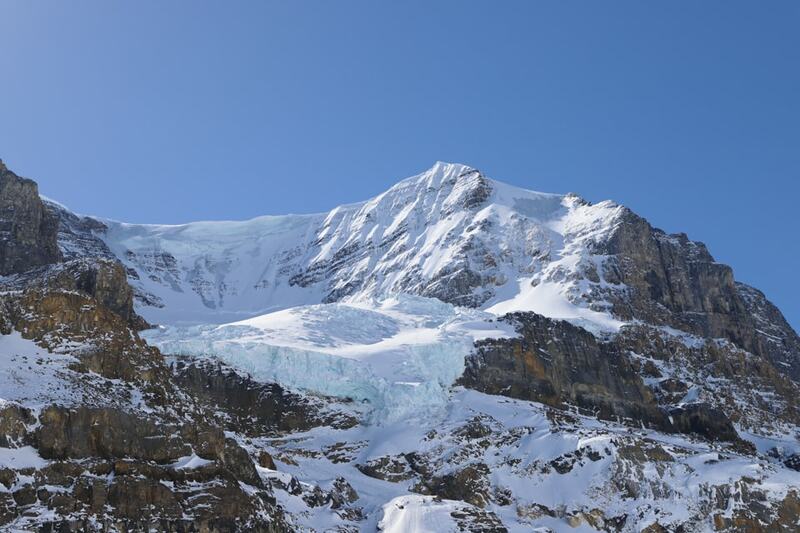 For those who want to do more, you can schedule a guided tour or even climb Mount Athabasca. This was one of our favorite stops on the tour. Though the water was not totally thawed yet and it was a bit icy, the views were just breathtaking. 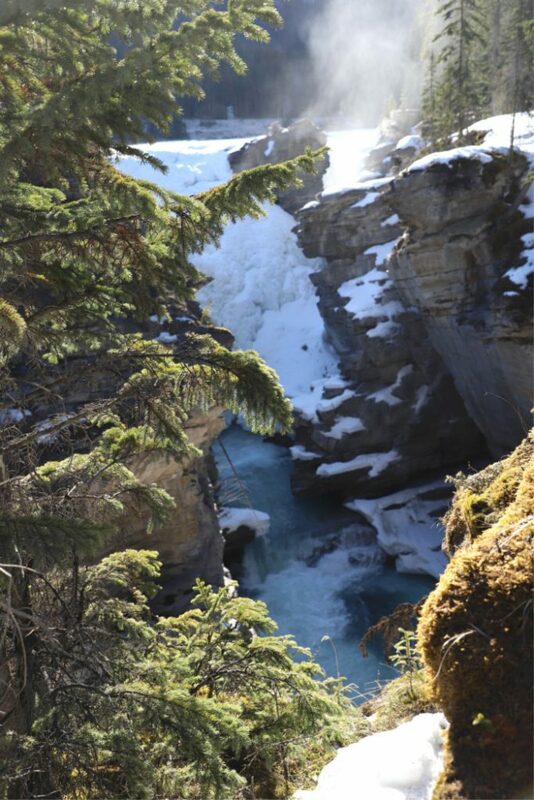 The Athabasca River begins at the Columbia Glacier and links the freshwater ice of the Columbia Icefields to the Arctic Ocean’s salt water. It’s the longest river in Alberta. We visited in April, and I might suggest going a bit later in the spring or summer. But then you’d miss the ice, which has a beauty of its own. It’s a tough call because it’s gorgeous either way. Walk along the trail and read about how the falls were formed. I found it fascinating. Again, I’d love to see this in the summer. I’ve seen photos and it’s just spectacular. The force of these falls is really what sets it apart. 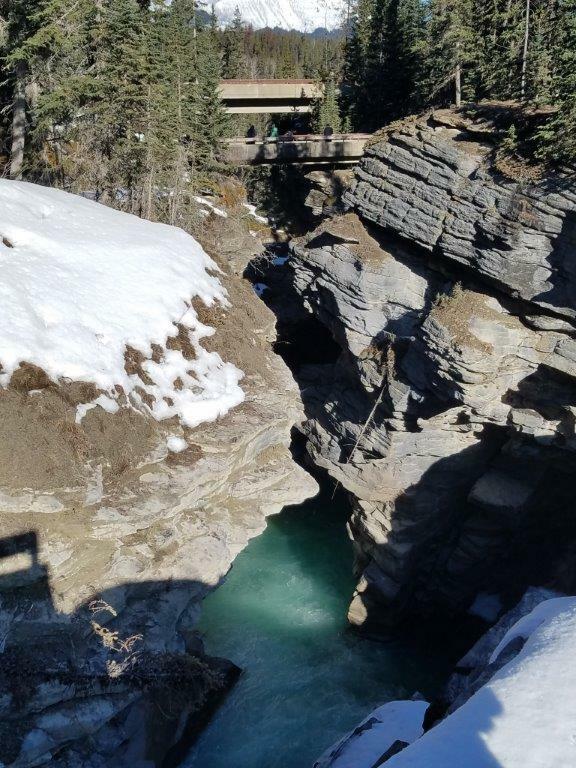 Just imagine how incredible it is when the snow has melted and water levels are high. Resembling a mountain with tears streaming down, the weeping wall was frozen when we were there. It was still just beautiful, but I’d love to see it in the summer. 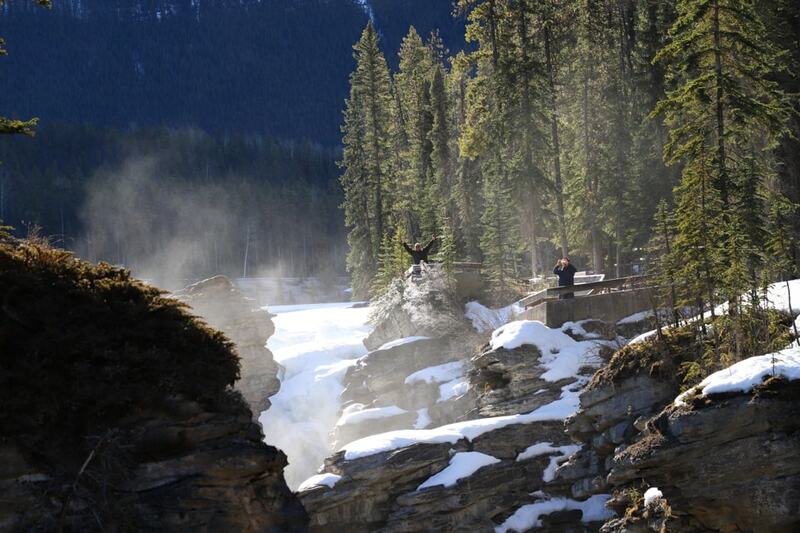 If you do decide to drive the Icefields Parkway, there is plenty to do along the route. Hiking is extremely popular, and you don’t have to be an expert as there are short trails, too. Several companies offer horseback trail rides, as well. You’ll also find campgrounds if you enjoy sleeping outdoors under the stars. You might even see mountain goats or bighorn sheep. I’m the first to admit I prefer luxury over camping. 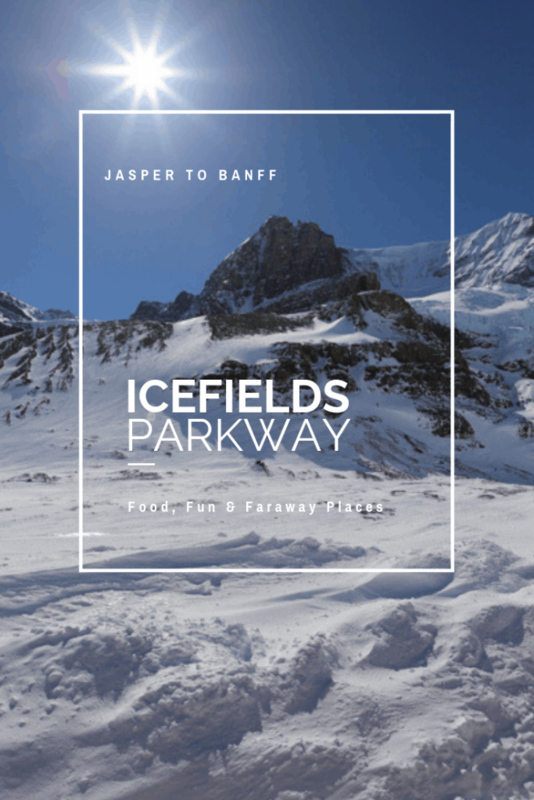 If you’re looking to be spoiled, spend a few nights in Jasper at the Fairmont Jasper Lodge and take the Icefields Parkway day trip to Banff as we did. Moose Lodge is where to stay in Banff. Spend a day exploring the quaint shops and bountiful restaurants. 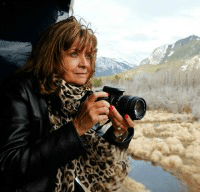 I’ve found the best way to explore the Canadian Rockies is on Rocky Mountaineer. The Icefield Parkway is included in several of the Rocky Mountaineer journeys. If you’re starting out in Vancouver, you’ve got to stay at one of the Fairmont Hotels. I adore the Fairmont Vancouver Airport Hotel. It’s so convenient and the food is superb! Prefer to stay downtown? Check out the historic Hotel Vancouver. If you’re heading to Kamloops on the Rocky Mountaineer, the Sandman is my favorite Kamloops hotel. Another fabulous destination you should definitely consider adding to your itinerary is Victoria on Vancouver Island. It’s one of my favorite places! Check out my list of things to do in Victoria BC. Have you been to Jasper or Banff? I’d love to know what you did while there. I hope to go back soon and I’ll check out your favorites! Share in the comments. Absolutely stunning. We were thinking of going somewhere tropical for a vacation, but now you may have changed our minds. This looks like an interesting place with lots of ice. This sounds like a beautiful vacation for anyone who loves the outdoors!